Four decades ago, NASA launched two robotic spacecraft, Voyagers 1 and 2, on a mission to cruise by the giant planets of the outer solar system on sweeping trajectories that would ultimately carry them far beyond. Today, both spacecraft are still functioning, sending back data from the cold, dark reaches of the frontier of interstellar space. Voyager 2 is over 10.6 billion miles from the sun, 115 times farther than Earth. Voyager 1 is almost 13 billion miles out—a distance that takes radio signals, traveling at the speed of light, over 19 hours to traverse! The Voyagers were launched in 1977—Voyager 1 on September 5 and Voyager 2 on August 20, so their 40th anniversaries in space are close at hand. 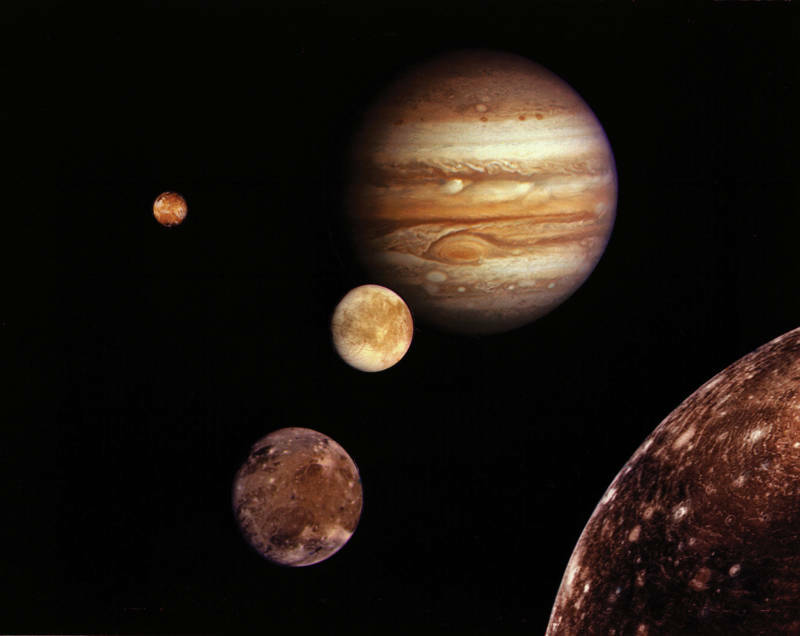 Voyager 1's objective was to explore Jupiter and Saturn, and gave us our first detailed images of Jupiter's four large Galilean moons. It also made a close flyby of Saturn's largest moon, Titan, giving us our first look at the moon's cold, thick, hydrocarbon-smog-laced atmosphere. Voyager 2 also passed by Jupiter and Saturn, before cruising onward to the cold and mysterious "ice giant" worlds Uranus and Neptune—which still have not been visited by any other spacecraft. Upon completion of their primary missions, both Voyagers coasted onward to ever greater distances, having achieved escape velocity from the sun's gravitation. And though they spent their earliest years of exploration traveling within the orbital plane of the solar system's planets, the Voyagers' final planetary encounters flung them in different directions. 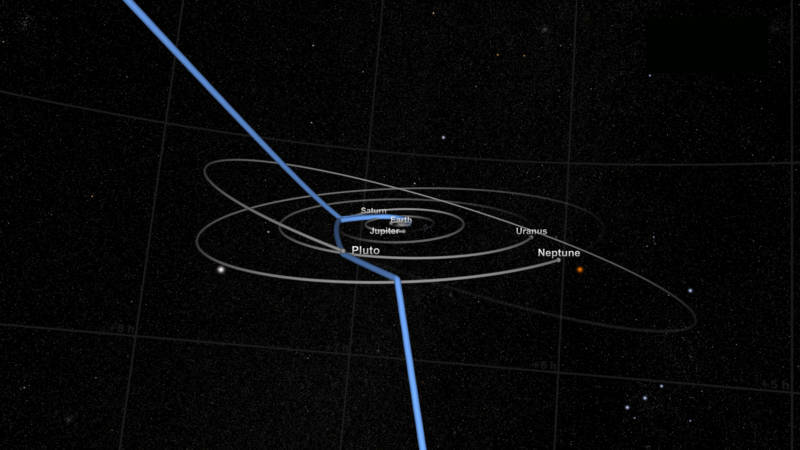 Voyager 1 is heading northward away from the plane of the solar system while Voyager 2 is going south. 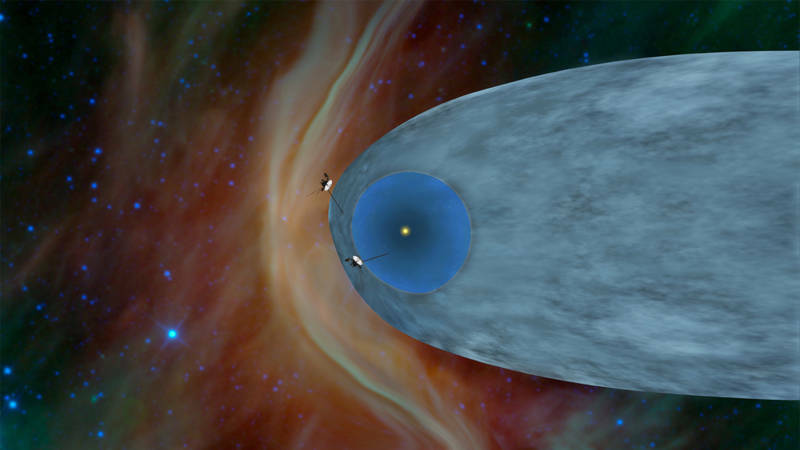 Since leaving the realm of planets, the Voyagers have been monitoring the physical conditions within the heliosphere, the extended "bubble" of gas, plasma, and magnetic fields emanating from the sun and blowing outward into space, called the solar wind. The goal of this extended phase of the Voyagers' mission was to find the boundary between the solar wind's influence and the environment of interstellar space: the heliopause. From Earth, we cannot detect that boundary—much in the way that you cannot "see" the boundary between Earth's atmosphere and outer space by standing on the ground and looking up. To find where space beings, you must send up a rocket to measure the pressure and temperature of the air. Voyager 1's measurements of the solar wind tell us that in August 2012, it did in fact cross the heliopause and enter the frontier of interstellar space, becoming the first human artifact to do so. Voyager 2 has not yet crossed the heliopause in the direction it is traveling, but when it does, researchers will receive data from two different points in the interstellar realm, which will offer a more detailed picture of the nature of space beyond the influence of the sun. How have these robotic explorers lasted so long? What machinery in your experience can last forty years with no maintenance, refueling, or recharging? The Voyagers had to last at least through their primary missions, which in Voyager 2's case included encounters with four giant planets over a 10-year period. Engineers had to anticipate the harsh conditions their robots might encounter, and plan accordingly—even though the actual conditions around the target planets and in the vast stretches of space between them were largely unknown. The Voyagers' sensitive equipment and computer systems are heavily shielded against micrometeorite impacts and high-energy radiation. Critical systems were given multiple redundant backups, so that if a piece of equipment fails a backup duplicate will kick in to replace it. 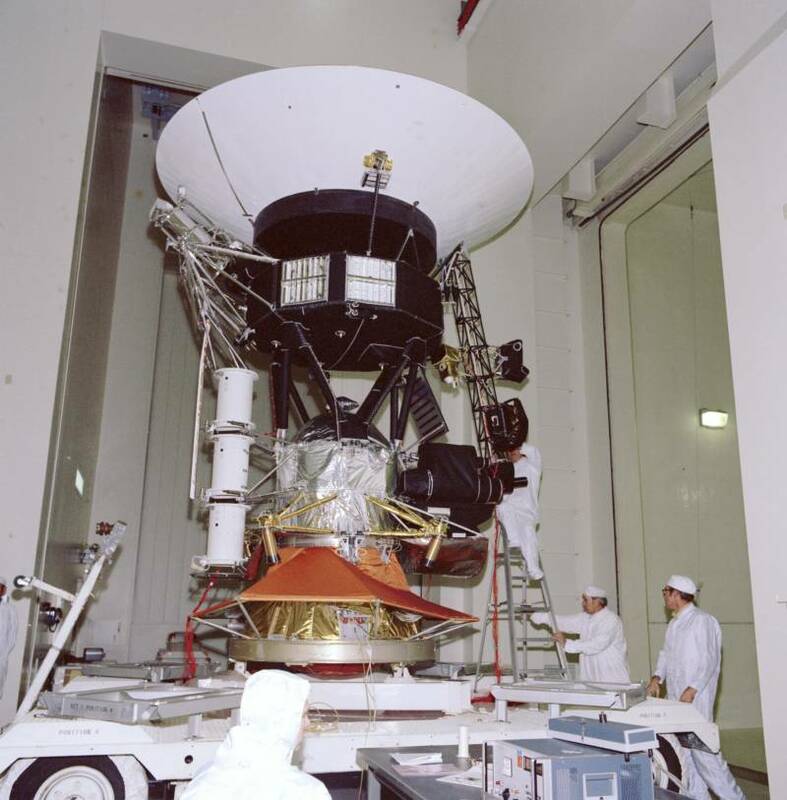 As for their power supplies, the Voyagers are each equipped with three radioisotope thermoelectric generators, which generate electricity from heat produced by the decay of Plutonium-238. At the time of launch each trio of generators produced 470 Watts, though the output has declined steadily as the Plutonium decays. It is expected that by sometime between 2025 and 2030, power will have fallen below the level needed to run any of the Voyagers' instruments. Messengers for ET? Good idea? Another ride-a-long feature on each Voyager is the "Golden Record," a gold-plated analog phonograph record carrying information about our world and species in a set of selected sounds and images. 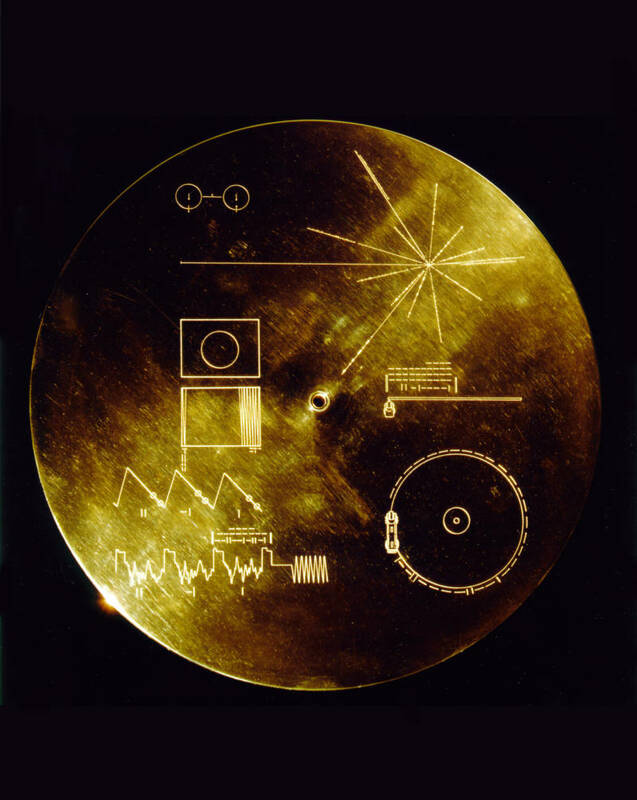 The records are intended as combination time capsules and greeting cards, in the event that either spacecraft is recovered by an intelligent alien civilization who can follow the graphical instructions inscribed on the record covers and extract the information on the disks. There are some who feel it may not be a good idea to randomly fling information of our existence and location into space for any would-be aliens to find--for how could we possibly know what those aliens are like, and what they would do with the information? Still, the chances of recovery of the tiny, soon-to-be-derelict spacecraft in the vast expanse of interstellar space is exceedingly small, and neither are heading toward any star systems in the near or extended future. Voyager 1 is presently heading in the general direction of a star called Gliese 445, which it will pass within 1.6 light years of in about 40,000 years. 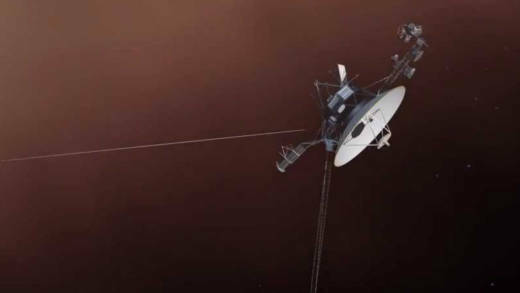 In the meantime, Voyagers 1 and 2 should continue to transmit home their measurements from the interstellar frontier, so may yet teach us a thing or two about our place in the cosmos.